“Give up the Emperor seat? You must be joking? !“ Emperor Diocletian retorted in disgust. June 2014, panorama from 3 vertical images, additional exposures for highlights, focal length 16mm, aperture f/11, shutter speed 20 seconds, ISO 100, tripod. The way the other men looked at Diocletian he realized they were completely serious. So what if he had fallen ill for just a year? Some disease must have spread at the circus he attended making him collapse in front of the crowds. I’d spent a year stuck in the palace thanks to the filth of those circus folks! Maybe one day I would give up the power, but at my peak when I just defeated the Persians? My visage brings is set into folktales to scare little Persian boys and girls into being good. Although, a few years ago I began the palace to spend my later years in Spalatum, Dalmatia, near where I’d’ spent my youth. My palace isn’t even finished yet. Eventually, Diocletian would be forced to abdicate his throne to the next Roman Emperors. He gave up his throne the same place where they crowned him, and his goodbye speech indicated he still had a strong desire to lead. The palace you see before you is where he would spend the last years of his life. 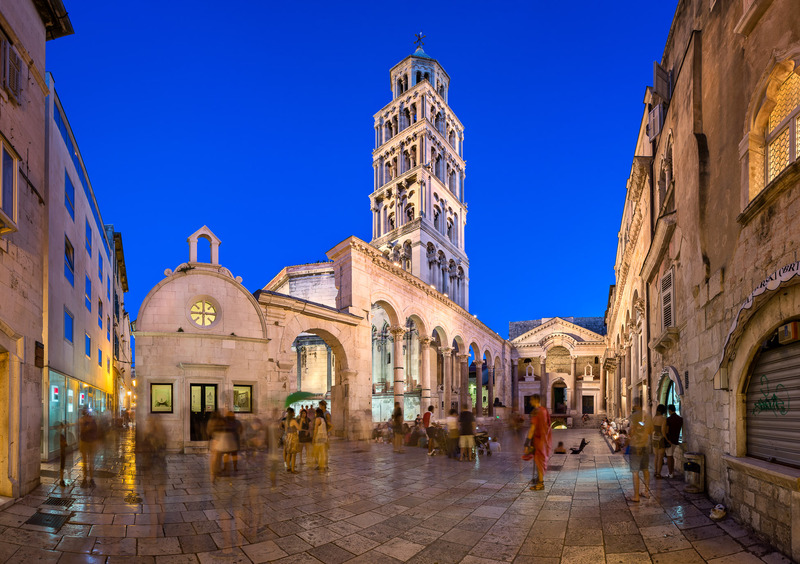 Located in the Old Town of Split, the Diocletian Palace offers a wonderful setting to photograph. Many parts of the palace ruins are still present today although many were destroyed since the 1,700 years it was constructed. It is hard to imagine why Diocletian wouldn’t want to retire to this estate, but he was lucky to being the only Roman emperor ever to retire rather than actually die on the throne. History and modern light merge into Split to create surreal scenes where you see the unbelievable, yet quite common, juxtaposition of the present and past for beautiful aesthetic results. Imagine, back in Diocletian’s time, this palace would be completely dark at night rather than lit by artificial lighting which shows off the white hue of the castle in the dark for a fairytale-like appearance. This entry was posted in City and tagged Croatia, Split.